Guinness was rescued from the Lake Los Angeles home of convicted dogfighters. LOS ANGELES – District Attorney Steve Cooley announced Thursday the most recent $5,000 reward paid by the Humane Society to an anonymous tipster who led authorities to an Antelope Valley couple deeply immersed in the blood sport of dog fighting. “Guinness,” an 11-month-old black-and-white male pitbull mix, attended the news conference with his owner, Carissa Cole. “Guinness” is one of 14 dogs rescued from the Lake Los Angeles home of convicted dogfighters Jesse and Yvette Jimenez, whose handwritten records included blow-by-blow narratives dating back to the mid 1990s. The District Attorney’s Office and the Humane Society recognized the tipster with a symbolic check. In keeping with the tip line’s confidentiality policy, however, the caller’s name was not released. Sheriff’s deputies who executed a search warrant at the home of Jesse and Yvette Jimenez discovered 11 adult pitbulls – all bearing scars or fresh injuries – and three puppies. Among the adult dogs was a female pitbull, believed to have borne several litters, whose teeth had been manually filed down to the pulp for the purpose of breeding her without injury to her partner. The criminal investigation of the Jimenez residence additionally revealed drugs with children in the home. 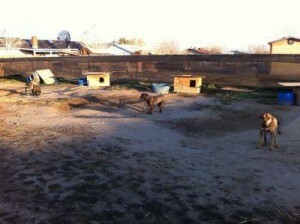 14 dogs were rescued from the home of convicted dogfighters Jesse and Yvette Jimenez. Jesse Jimenez, 44, is scheduled to surrender to authorities Friday to begin serving 365 days of actual time, meaning he must serve the entire duration of his county jail term. Jimenez pleaded no contest on Nov. 30, 2011, to 31 felony counts including dog fighting, willful animal cruelty and animal neglect. Co-defendant Yvette Jimenez, 42, pleaded no contest to one count of willful animal cruelty and two counts of felony dog fighting on Nov. 30, 2011. She was sentenced to three years of formal probation, completion of an animal cruelty counseling program and restitution. The defendant was ordered released after serving 274 days of actual time in county jail.